A lot of words are being thrown your way about the situation going on in Syria at the moment. You will hear terms like World War III, chemical air strike, air strike, civil war, etc etc. Here is a short break down of what’s going on and the different point of views that are out there about Syria. On August 31st, President Obama first came out and said that he believes we should go into Syria, but he decided to leave the decision up to Congress. A bold move that both people on the right and left are surprised about. Some say its sign of weakness from our President. Others believe it was a way to give him more time to figured out the best course of action. His speech came after a deadly attack a week before in Syria where almost 1,400 people were killed, mostly of women and children. Millions have been displaced since the start of this war. Some people believe the president seemed very passionate about our need to intervene, calling this an humanitarian effort. Others believe he is too busy playing on the emotions of American citizens by constantly bringing up how many children have lost their lives. And that this is distracting from the fact that our country can’t afford to end up in another war. However after last night’s speech, the President has decided to prolonged Congress decision on whether we should attack Syria. To fully understand what is going on Syria, you need a backstory. The country has been at war with itself for almost two years now. As of August 2013, more than 100,000 Syrians have been killed, according to the United Nations. President Bashar al-Assad of Syria has been in power since July 2000. He was reelected as President in 2007 winning 97% of the vote. Before him, his father Hafez al-Assad, ruled Syria from 1970-2000. In the March of 2011 there was a political and violent uprising, after a group of children and teens were arrested for writing political graffiti. Dozens of people were killed after government forces cracked down on demonstrations. These demonstrations sparked multiple protests in the country, which lead to the government trying to appease their highly upset citizens. They announced salary increases for their state employees to lifting Syria’s long standing emergency law and the licensing of new political parties, anything that would make the protests and demonstrations to stop. From there, the next two years consist of more deadly unrest from the people, failed attempts of al-Assad trying to bridge back the government and it’s people, other organizations like the European Union and countries like Turkey to place sanctions against Syria due to “the continuing brutal campaign” by the government against its own people, and the U.N Security Council trying to send military observers for 90-day mission, but failed after three days due to the increasing violence in the country. Back in April of this year, U.S Secretary of Defense Chunk Hagel announced that the U.S had allegedly found evidence of a chemical weapon called sarin has been used in Syria on a small scale. Sarin is clear, odorless, and tasteless liquid that once is evaporated into a gas can spread out the environment. Not immediately deadly, but long lasting contact of the chemical can lead to death. For more facts on Sarin, read more here. It wasn’t until the alleged that surfaced August 21st of chemical warfare that backed up Hagel statements. U.S Secretary of State John Kerry declared that U.S. intelligence information has found that 1,429 people were killed in August 21st chemical weapons attack in Syria, including at least 426 children. According to CNN, Kerry announces that samples of blood and hair taken from eastern Damascus have “tested positive for signatures of sarin”. He backs President Obama and agrees that military strike should be our course of action. Recently Russian has proposed for Syria to surrender their chemical weapons, “to thwart U.S. aggression,” to be put under “international control”. Syria’s most powerful ally, Russia has essentially agreed to take control of their chemical weapons, a move the French aren’t too happy with. The French have proposed a solution to the U.N Security Council that would force Syria to give up their chemical stockpile, but not to the Russians. On August 29th, The U.K Parliament voted against any military action in Syria. With this new proposal on the table, British Prime Minister David Cameron had agreed that his country would join forces with President François Hollande of France and the U.S. in putting forward the proposal. This proposal could lead to the end of the possibility of U.S attack on Syria. In a recent poll done by the Associated Press, only 1 in 5 Americas believe that if we failed to respond to the chemical weapon attacks in Syria will lead to an all out War amongst other rogue governments. The poll of 1,007 adults nationwide found that most Americans oppose even a limited attack on Syria – likely with cruise missiles – despite Obama administration warnings that inaction would risk national security and ignore a gruesome humanitarian crisis. 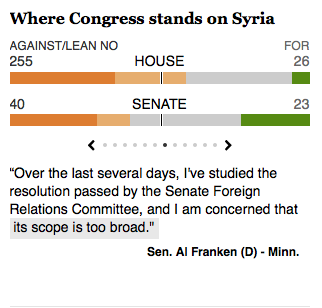 And a slim majority – 53 percent – fear that a strike would lead to a long-term U.S. military commitment in Syria. Most Americans do not agree with the President, many are also pretty undecided about the entire situation. We see the same division amongst party lines as well. AP’s poll shows that only 53% of Democrats, 59 percent of Independents, and 73 percent of Republicans believes congress should against the strike in Syria. Only a quarter of democrats believe that an attack will cease any other world leaders from engaging in chemical warfare. 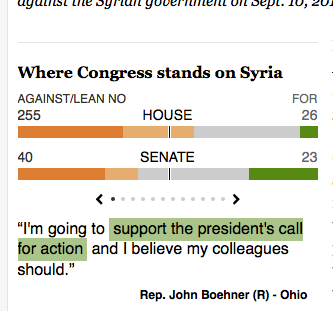 Allowing Congress to decide whether we should take military action was a political move by the President. The jury is still out if this was a good decision or not. 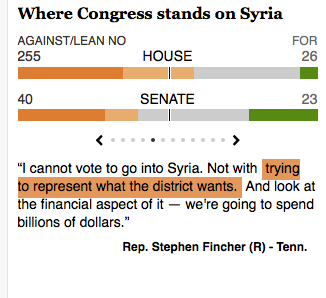 Congress is just as divided on Syria as the American people are. Above is just an outline of some of the major points about the situation in Syria. What I suggest? To research for yourself what’s going on. I’m not here to point you in the direction of what we should or shouldn’t do. All the light night talk show hosts, political talking heads both the left and right, and our government officials will tell you what they think. Take the time out and decide for yourself what you believe and then come to your own conclusions. Even if your conclusions are still undecided.